Inca Empire to Peruvian Amazon – The Great Canadian Travel Co.
From its amazing archaeological treasures to its gastronomic delights and from its scenic beauty to its melting pot of cultures, Peru offers visitors a wide array of attractions—and on this tour including an Amazon River cruise, you’ll experience its highlights. As availability on travel programs changes frequently, please contact us for the most up to date availability on the trip you are interested in. Some dates that are listed may be sold out, but we will suggest alternate cruises or dates to fit your travel needs. Prices are shown in CA$ per person based on two people sharing a cabin. Single rates are available on request. Triple cabins are not available on this cruise. Special offers may be in place from time to time and are not reflected in the prices listed above. We will always check for specials or discounts on the cruise date you are interested in prior to putting your reservation into place. Welcome to the cosmopolitan city of Lima, where you will be met by your Tour Director. 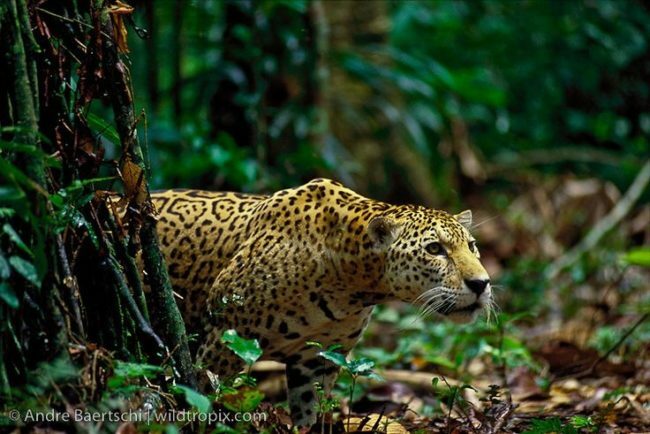 Get ready to discover age old cultures, rich traditions, the legendary Inca Empire, and the mighty Amazon Basin! This morning, join your Local Guide on a walking TOUR that focuses on Lima’s colonial heritage in the old quarter of the city. Start at the Plaza de Armas, boasting the city’s original colonial architecture from over four centuries ago. 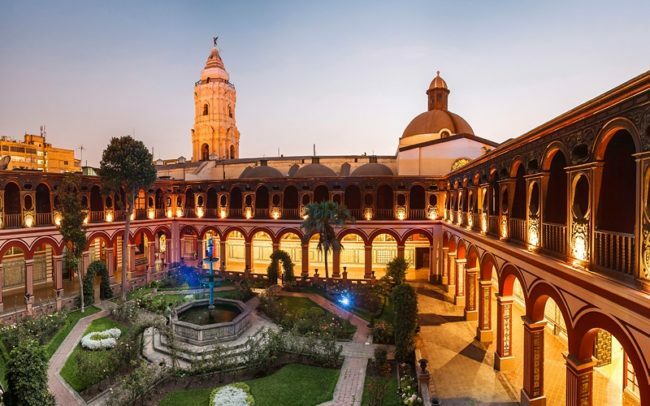 See the Government Palace, where Peru’s president resides, as well as the Renaissance/Baroque-style cathedral. From here, stroll to the venerable San Francisco Monastery with its splendid 17th-century cloister murals. For a special treat, visit the Larco Herrera Museum, which houses the largest private collection of pre-Colombian Peruvian art in the world. This evening, enjoy a special Local Favourite and welcome dinner at one of Lima’s finest historic mansions, Casa Garcia Alvarado. Hosted by the home’s owner and your Tour Director, toast the exciting start of your vacation with your fellow travelling companions and enjoy some typical Peruvian food. Fly to Cusco, the ancient Andean city that was once capital of the Inca Empire. Spend the day in the Sacred Valley of the Incas, starting with a visit to the Temple of Sacsayhuaman, perched on a hillside overlooking Cusco. With its massive stones weighing up to 300 tons, this 15th-century fortress is one of the best displays of the Incas’ impressive stonework. While most believe it was a religious temple, Sacsayhuaman was also site of one of the most violent battles between the Spanish and the Cusqueños. The Spanish were ultimately victorious in 1536, disassembling part of the site to build homes in Cusco and leaving behind the ruins we find today. Next, stop at the ceremonial site of Kenko, where ancient rituals were performed—perhaps, even sacrifices. Nearby, see Puca Pucara, thought to be a rest stop, weapons storage, or guard post used by the Incas and their soldiers. At Awanakancha, encounter llamas, alpacas, vicuñas, and guanacos and learn the difference between these South American camels and their importance in Peruvian culture. 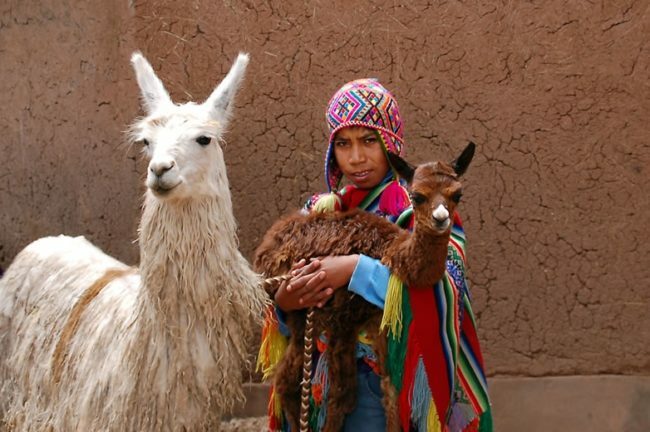 Continue to the old mountain village of Pisac, home to a huge Indian market where you will have free time to shop for local wares such as alpaca sweaters, blankets, and handmade jewellery. This evening at a Peruvian Paso Horse Show, learn about (and even take a ride on) the horses bred here specifically for the terraced landscape. Top off the day with some wine and an Andean-style dinner. 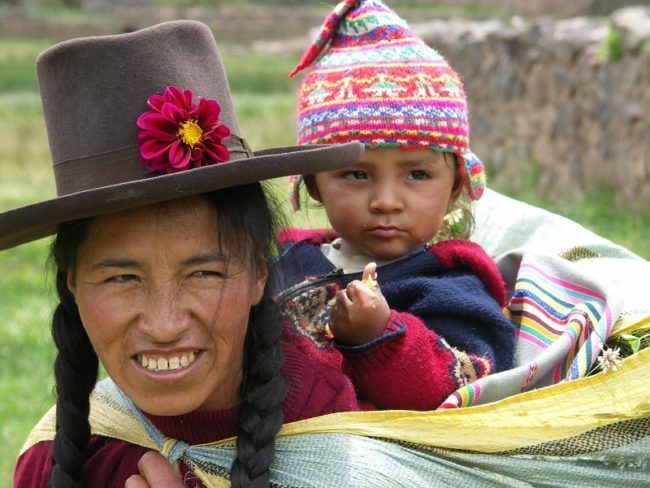 In the small village of Ollantaytambo this morning, visit the Inca fortress followed by the opportunity to visit a native Inca’s home and experience their way of life. Next, board the Vistadome train for a short journey through the lush Urubamba Valley to Aguas Calientes. From here, take the winding road up to legendary Machu Picchu, known as the “Lost City of the Incas”, hidden so well that the invading Spaniards never found it. High above the steep valley overlaid with dense tropical jungle, a Local Guide will bring you closer to the lives and mysteries still hidden in these amazing structures built by the pre-Columbian masters of this sacred land. Tonight, stay at the foot of the mountain where Machu Picchu is found and enjoy an exquisite dinner prepared from regional Peruvian ingredients. 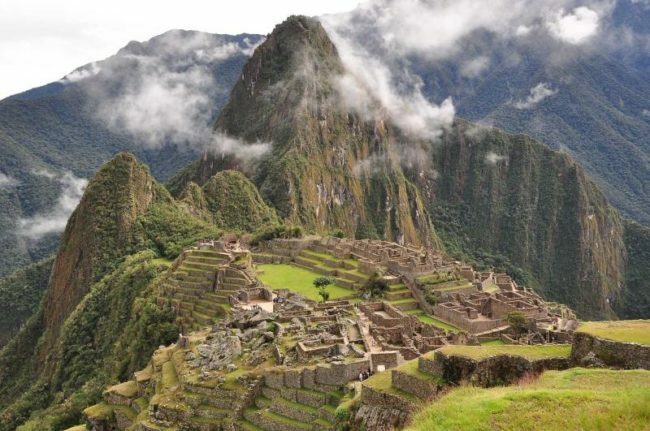 If you choose, rise early today using your second included entrance to Machu Picchu and see the sunrise over the ruins. Enjoy the tranquillity of the morning as you wander the ruins at your own pace and experience the magic that is Machu Picchu. Explore the terraces or perhaps venture up to see the Sun Gate, once used as the ancient entrance to the Sanctuary. After lunch, return to the Sacred Valley by train and continue on to Cusco. Set out on a guided Cusco walking tour with a Local Guide to learn more about the Incas and their struggle against invading Spaniards. Visit the Santo Domingo Monastery, originally called Koricancha and built by the Incas as a Temple of the Sun. Today you can still see the impressive Inca masonry that provided a foundation to the Baroque church the Spanish built on top of the Inca temple. Continue to Cusco’s Plaza de Armas to visit the imposing colonial cathedral before enjoying the remainder of the day at leisure. Tonight, enjoy a special dinner at one of Cusco’s most elegant restaurants, featuring wine and food inspired by Peru’s eclectic mix of cultures. 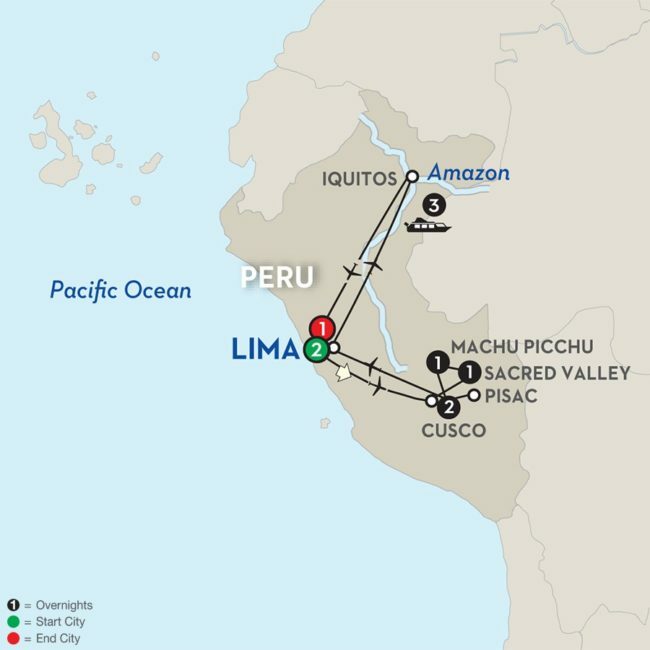 Bid farewell to your Tour Director in Lima when you board a flight north to Iquitos. Upon arrival, enjoy an Iquitos city tour. Explore the areas of this bustling river city that flourished during the “rubber boom” in the early 19th century. See some of the ornate homes of the rubber barons, including the Iron House, which was designed by Gustave Eiffel. Next, stop at the Manatee Rescue Center, where your visit will teach you about the endangered Amazon manatees and conservationists’ efforts to save them. During this visit, you will even be able to bottle feed these gentle giants! 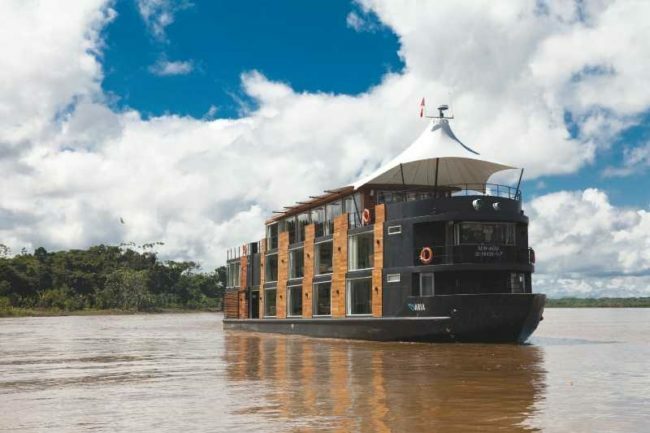 Continue to the Amazon Discovery, your luxurious, floating home for the next three nights. On board, settle in to your spacious suite before meeting your on-board Naturalist and Cruise Director at a welcome cocktail hour. Learn about the animals you’ll encounter, the native villagers you’ll meet, and the astonishing plant life you’ll see—like the giant water lily, with flowers the size of soccer balls and leaves that can grow up to eight feet in diameter and support the weight of a human! Later, sit down to an unforgettable dinner featuring Peruvian cuisine with the freshest local ingredients. Later tonight, local entertainers from the ship’s crew will light up the night with music and dance! If you’re an early riser, your first glimpse of the majestic Amazon as the sun creeps up over the horizon will be truly breathtaking. The sights—and the sounds— will stay with you forever. After breakfast, board pangas that will take you down one of the Amazon’s tributaries in search of the region’s freshwater pink dolphins. 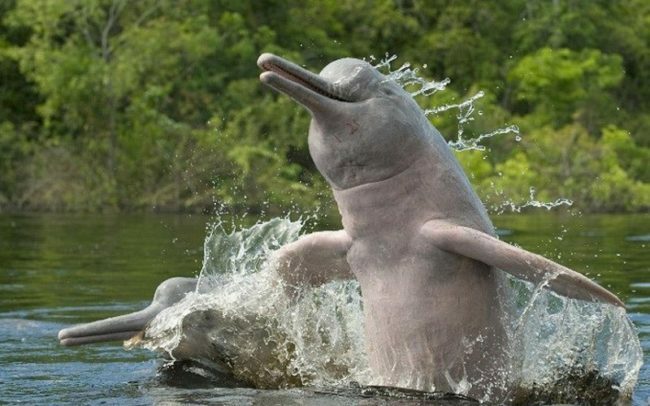 Get your cameras ready, as this is a favourite feeding spot for these rare dolphins. While here, you even have the opportunity to take a refreshing swim in this unique area of the Amazon. This afternoon, back on board, a special treat is in store when the ship’s chef invites you to a hands-on cooking demonstration to learn about native fruits, vegetables, and fish. 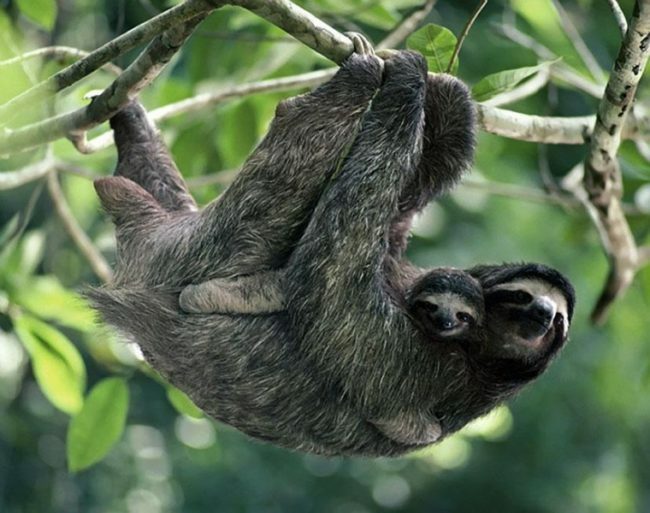 After lunch, head out with your Naturalist in search of the Amazonian wildlife on the water and on shore. 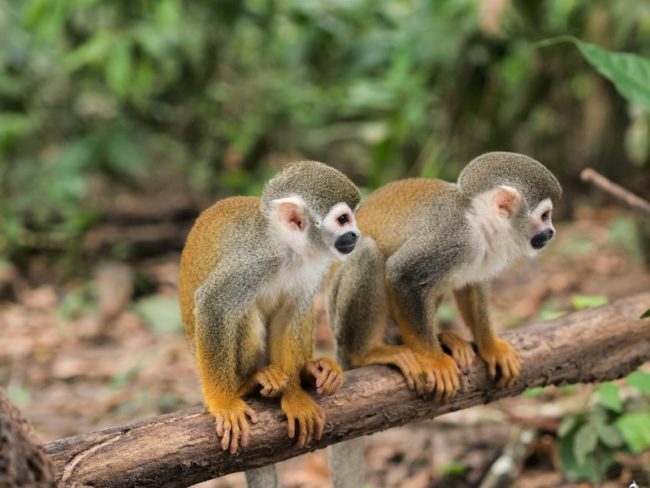 We are on the lookout for monkeys, including capuchin, howler, tamarin, and spider monkeys, as well as iguanas, sloths, and a wide variety of birdlife. You will also learn about the tropical flora found in the Amazon as you walk along the shores with your Naturalist, who points out epiphytes, orchids, and indigenous jungle vegetation. 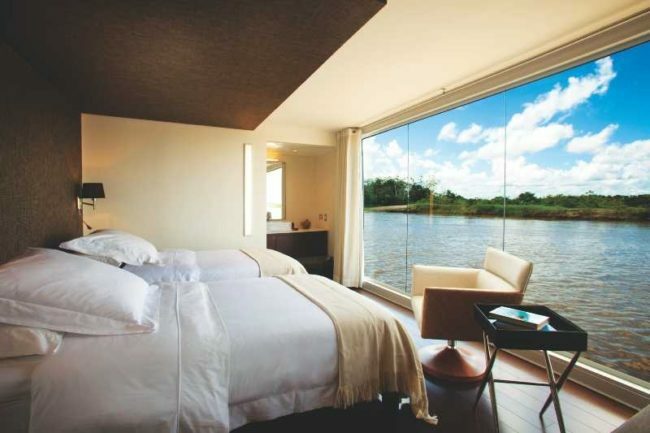 This morning, wake up under the serenade of early morning birdsong at a historic place, the confluence of two powerful tributaries, the Ucayali and Marañon Rivers, which gives birth to the mighty Amazon! 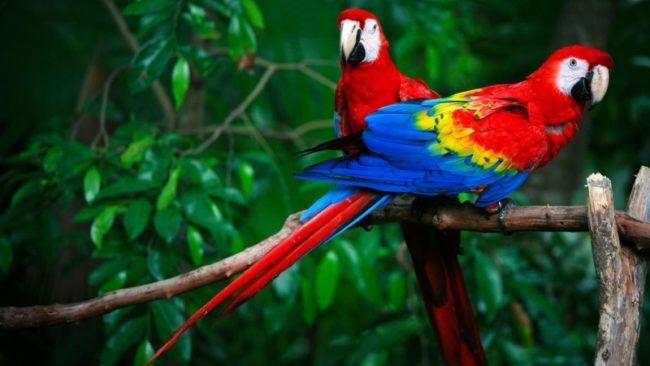 An early morning outing here allows you to witness the activity of exotic birds like trogons, macaws, parrots, falcons, and jacamars, to name a few. Nearby, visit a native village, where you’ll stroll around their community, visiting the people, their homes, and a school. Spend time with the locals, learn about their culture, traditions, and folklore, and even visit a small handicraft market—a great place to pick up some authentic souvenirs. This afternoon’s excursion is a local favourite that takes you to a river community to visit a Shamanic Healing Clinic. A local shaman introduces you to the world of hallucinogenic and medical plants, all found in the Amazon. 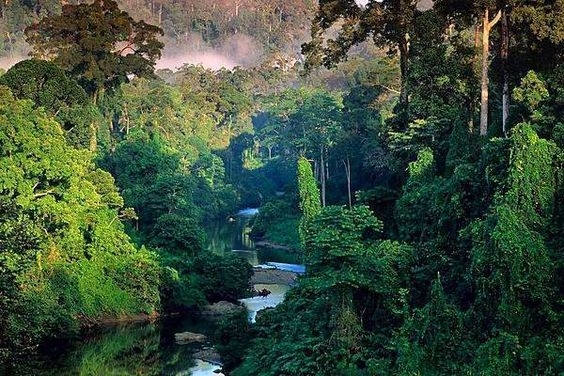 After dark, embark on a night safari in search of caiman, frogs, bats, boas, and a variety of nocturnal wildlife. This morning, say goodbye to the Amazon Discovery and return to Iquitos for your flight to Lima. Note: Maximum elevation on the tour is 11,200 ft.
After some free time in Paracas, return to Lima today. Tonight, toast your final night in Lima with dinner at a local restaurant. It’s about you. You are the reason we’ve used our 85-plus years of travel expertise to design the very best small-ship cruising experience. Inspired by you, we’ve taken everything special about small-ship cruising and made it even better. Here are some of the features and amenities you’ll experience with Avalon. Luxurious standards in elegant atmosphere. Expedition team of multilingual Naturalists. Daily multi-media natural history lectures. A lounge serving premium spirit cocktails. Observation area to watch local fauna. Open seating for all meals. Access to a resident paramedic. Eight passenger skiffs for flora and fauna viewing. Maintain your routine in the exercise room. Complimentary regional wines at meals. Complimentary coffee, tea, soft drinks, and local beer/wine throughout the day at the bar. 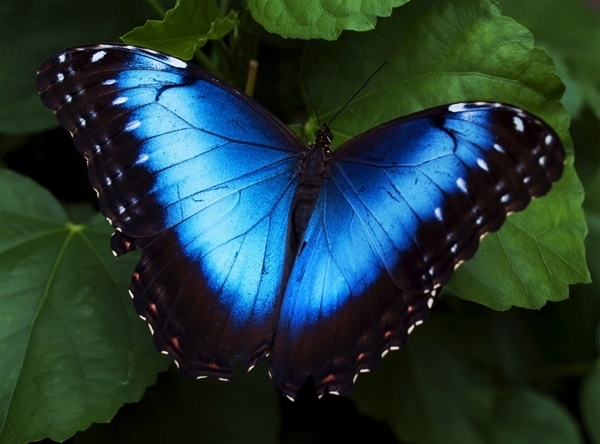 Included shore excursions with Local Naturalist. Unique cultural activities & interactions with locals. 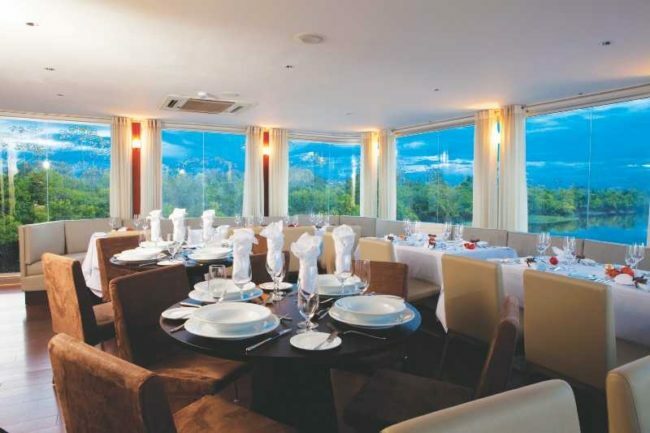 Intimate cruise experience with maximum capacity of 32 people.